The Energy Report is a feasibility study into sourcing 100% of the world’s energy from renewable resources by 2050, commissioned by the World Wildlife Fund in collaboration with renewable energy consultancy, Ecofys, and dutch architecture firm, The Office for Metropolitan Architecture. It is available here for download. The future scenario explored by Ecofys is based on a unique model that predicts a decrease in energy consumption of 15% by 2050, despite the expected growth in global population and wider access to energy-intensive activities such as industry and travel. This will be achieved via ambitious but achievable energy-saving measures like an increase in the use of recycled materials, a reduction in the quantity of meat we eat, a switch to more energy-efficient transport, and thermal upgrades to new and existing building stock. The report provides some startling insights into the realities of climate change and resources demand, including the assertion that “1.4 billion people [currently] have no access to reliable electricity”, but none more eye-opening than its ultimate conclusion that a 100% sustainable future is indeed a realistic goal. It argues that whilst this future will require an annual investment over the next 25 years in the order of 1 – 2% of global GDP (which currently sits at AU$58 trillion), this investment will become cashflow positive by 2035 and will generate savings equal to 2% of GDP by 2050. Ecofys explores in an extraordinary amount of detail the various social, economic and technical hurdles that must be overcome in order to achieve the aim of 100% renewable energy. In so doing, it expands the somewhat limited issues of climate change into their true dimensions, clarifying the many conflicting elements of a planet-wide ecology in a way we have never before witnessed. We are particularly impressed with the financial study that crystalises the endless rhetoric surrounding the “cost” of sustainability into comprehensible figures: 1 – 2% of GDP is, as it happens, not that much more than the current global subsidies provided by governments for fossil fuel extraction and refinement processes. This is a remarkable, ambitious and exciting contribution to the energy debate. WWF has set its sights high: in aiming for a 100% renewable and sustainable future, it offers a serious vision with the power to transform the way the entire world thinks. We applaud WWF for proposing a scenario that goes all the way in rectifying the damage the 20th Century has wrought on the planet’s climate and resources. With the opportunity of 100% renewable energy on the table, Australia’s pledge at Copenhagen to reduce energy demands by 5% from 2000 levels is revealed as an unethical and politically weak commitment by a country clearly disinterested in playing any significant part in safeguarding our environment for future generations. This is only more apparent after reading the Australian addendum to the Energy Report that claims we “could lead with [the] world’s cheapest renewable energy”. Just what does our government think it’s doing? 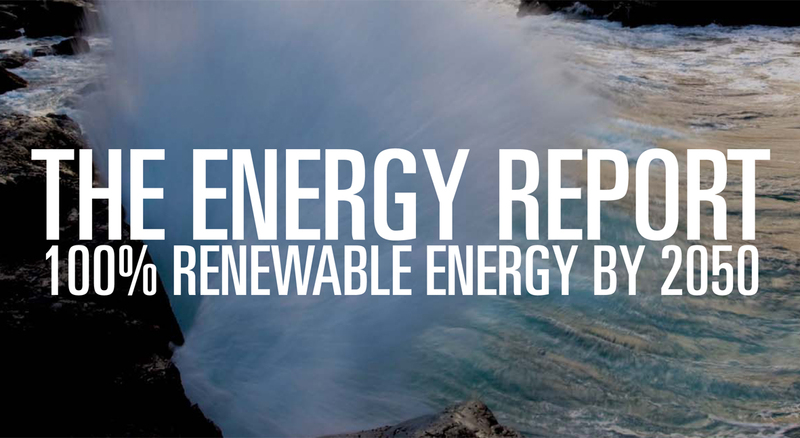 With the Energy Report, WWF has illustrated that a 100% renewable future is technically possible. All that remains to be seen is whether we, as a people, have the courage and determination to make this possibility into a reality.